So I went to Hollywood. 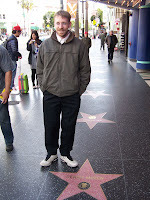 And got my photo by some of the cooler stars on the Walk of Fame. Here's one of those photos. More to come as I get them e-mailed to me. When I'm standing in line for fast food and the person behind the counter says, "I can help whoever's next." I make a conscious decision every time I hear that not to tell the person that it's "whomever."